ME and HER: A Memoir of Madness reveals how Karen Tyrrell, a dedicated Australian teacher is repeatedly harassed by parents at her school to breaking point and beyond. In a fit of desperation, she escapes and runs. Police and medical professionals discover her hiding in a lonely motel, forcing her into the frightening world of the psychiatric system. The reader is taken back to the classroom. We discover how the harassment affected Karen as we journey through her gradual decline and disintegration leading to her incarceration. Later Karen performs an ‘experiment’, purposefully stressing over a disturbed student, keeping herself awake at night. All in order to kick-start the creative ideas she craves. ME ─ wife, mother, writer and teacher. HER ─ manic, psychic, healer to the living, telepathic to the dead, and she’s very psychotic. Click HERE to buy ME and HER: A Memoir Of Madness . eBook or as a print book. 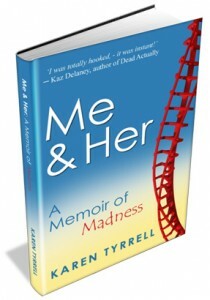 “Karen Tyrrell has made a significant contribution by telling her story of mental illness in her courageous memoir. In brave and beautiful prose, Karen recounts her struggle with bipolar – telling not only how she became ill, but also her desire to understand her illness and prevent a reoccurrence.’ – Audrey Streetman, USA mental health advocate. 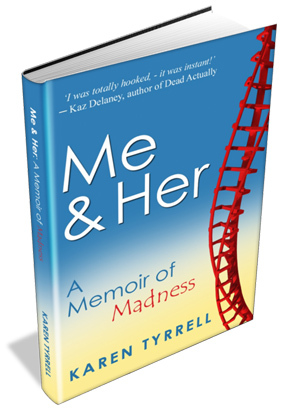 The sequel ME & HIM : a Guide to Recovery came out March 2013. Good for you ! Hope the new beginning will bring you the publication you so desperatley want. There are not enough books out there covering the subject and surely this can only help someone going through the same thing as you did. Hang in there and be positive. Hi Karen, it sounds like your Me and Her memoir is destined to be published. With your short story of a similar theme being published in August 2011, and with a positive review from professional editor Sally Odgers under your belt, one would think the natural gravity of the situation, along with your personal experience of bi-polar suffering, and the fact mental health is rising to the fore in the media and governmental policies, would lend itself to publication. If you want, you could be a guest speaker at a monthly FAWQ meeting in the city this year. Good luck with it all. Fellowship of Australian Writers Queensland. Hi Karen, I have to really congratulate you. I really feel that I too can change my life around. I would have to get involved in a group in my area if they have one. I live in a very small town, and the people here frown upon anyone with a mental illness. I have been called crazy, and even evil they fail to realize that I am suffering with a real life situation and their awful words only hurt even deeper. I would like to make people aware that having a bipolar disorder is not something that I choose to do or even can help, but I can turn it into something positive therefore I want be the laugh or talk of the town. Thanks Sonya for following me over to my website. You definitely can turn your life around. You need to be persistent and determined. When you join a group in your area, please choose one that’s positive and supports you. Chose your friends carefully too. Stigma against mental illness is running rife everywhere so you need to protect yourself. The best of luck with the agent and then publication. Pouring your heart out about your illness deserve plenty of encouragement. People need to know about this touchy subject, especially from someone who has experienced it (not a medical professional). Due having short stories already published, you obviously have writing talent, so keep being positive and good things will happen. I’d like to know what the agent thinks and what they can do to push the manuscript. 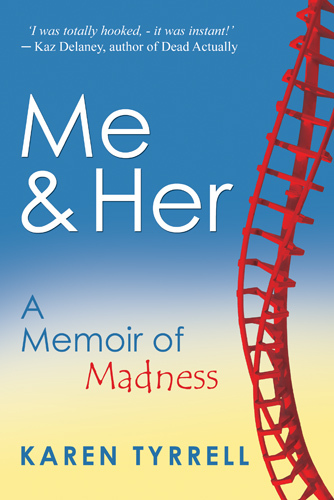 Hi Karen and congrats on your book ME AND HER: A Memoir being published – PLEASE keep us posted on Facebook as to when it will be available! How many pages is it? I am in the midst of writing my memoirs, got two chapters in the bag, but now it’s slow going due to some stress in the family. I can’t concentrate on it. I’m sure the writer’s block will dissipate soon though. Again, congrats to you and look forward to hearing more good things about it! Well done! Best of luck to you. Thank you for that great post. Please feel free to visit our website CIC. My book was requested by an American Publisher. Hope its published soon. I send out a monthly MH newsletter with positive strategies to keep well. Whats your email address and I’ll add you to the contact list? I am very intersted in reading your book- is it available anywhere at the moment? My friend has bi-polar, and i would like to try and understand more about it! My book was requested by an American Publisher. Should be published soon. If you go to my website and click on the category on the top right, ” SPEAKING OUT ON BIPOLAR” you can read 16 posts On Bipolar and you’ll find pages 1,2, 3 of “ME AND HER :a Memoir of Madness” right at the bottom. I send out a monthly Mental Health eNewsletter with positive strategies to keep well. May I add you to the contact list? How lovely it is to find someone who has similar interests and values and lived experiences as me! I thank you for your time and I am looking forward to connecting with you more in the future. I too am in the process of writing my own book. Thanks for connecting with me on Facebook and following me here to my memoir page. I look forward to getting to know you better and sharing our common interests. PS. Josie is the name of my main character in SAYONARA, my crime faction based on a true story. I have bipolar myself and always interested in making others more aware of the realities of bipolar: that most of us do very well on medication and can achieve great things despite our illness. Further, our illness is only a small part of who we are, not our identity! Nice to meet you Cate. Thanks for coming over from PlanBig to support me. I agree with everything you’re saying. I had some very severe psychotic episodes and I have come a long way in my recovery. Hope you’ll stay tuned as ME AND HER will be Published soon! Hi Karen, would love to read your book… was thinking of writing one myself 🙂 I experienced depression and anxiety and have now recovered but only after doing a lot of “work” to change my life and understand myself. As a bloke I’ve had to rethink my ideas about masculinity and get a whole heap of emotional skills that I lacked. Now I work part time helping others in their recovery. Your courage and strength are an inspiration to everyone struggling with mental health issues. The honesty you bring to your writing will help reduce the stigma around mental illness by educating and informing people. It is only through people like you that those in society lucky enough not to be affected by mental illness will realise how lucky they are and also learn not to judge others. Thank you for your dedication and commitment to raising both the profile and understanding of the effects of bipolar and other mental illness and the fact that recovery is possible. I look forward to meeting you and talking in more detail. Thanks so much for coming over here to check out my website and my books. Like you, I’m passionate about mental health and dream of seeing changes to Mental Health awareness.